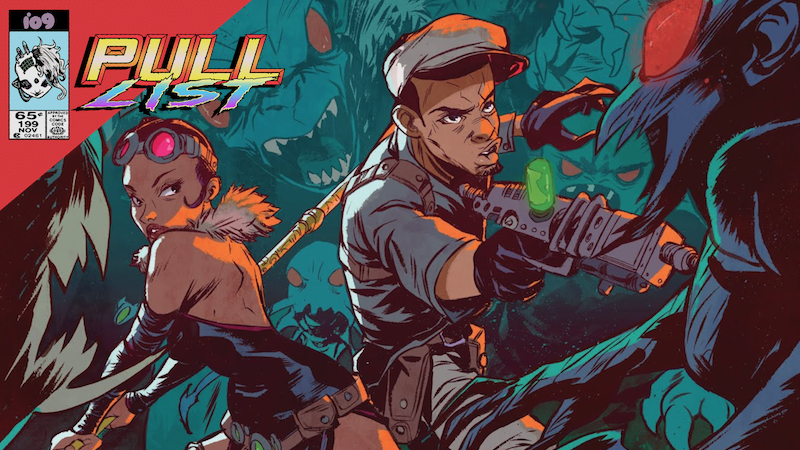 It’s not often that bo staffs and laser guns end up being lumped in with one another, but the plots of this week’s best new comics just so happen to make that very much the case. Whether you’re battling demon spawn or alien parasites, you’re going to need a weapon that will put you on even footing with them (and, ideally, give you the ability to vanquish them). The heroes of this week’s best new comics, thankfully, have those kinds of weapons at their disposal, but it’s their not knowing just what kinds of cataclysmic battles they’re about to face that makes their predicaments so perilous. An unsuspecting human facing a young xenomorph. In almost any other circumstance “it’s based on a movie script” would be the kind of glaring red flag that might make a reader not want to pick up a particular comic book, but Dark Horse’s adaptation of William Gibson’s Alien 3 is unique. Borrowing from the rejected script that Gibson originally penned with the intention of it becoming the third installment in the Alien franchise, the comic delves into a “what might have been” story focusing on what happens after the Sulaco makes contact with a human-filled space station. Intercepting spacefaring humans isn’t at all out of the ordinary for the unsuspecting humans in the comic, but what they don’t know is that the Sulaco’s passengers aren’t all human—the vessel has a xenomorph on board and it’s something that the space station is (understandably) not prepared to deal with. Blink Sangerye taking out a demon. Image’s Bitter Root, from writers David Walker and Chuck Brown and artist Sanford Greene, is the kind of comic that makes it clear just how much black voices have been missing in the comics canon—and how we’ve all been missing out because of that fact. Set in the midst of the Harlem Renaissance, Bitter Root tells the story of the Sangeryes, a family of demon-hunters who are renowned for their unparalleled skill at concocting a special serum derived from magical roots. Unbeknownst to the world, the Sangeryes are one of the few remaining families of hunters with deep knowledge of the jinoo, a breed of demon that are actually humans who have gone through mysterious transformations. Were it not for the Sangeryes’ serum and hunting skills, New York would be overrun by the creatures and become even more of a hellscape than the city already is by default. But for all the good the Sangeryes do, they’re still forced to deal with the all-too-real, racist evils of the early 20th century that blind people to the fact that they’re heroes regularly risking their lives to protect humanity.